Running form guru Danny Abshire tells you how to perfect your technique to run for a lifetime. Unlock the secret of running better, stronger and faster—with lower risk of injury. Running form guru Danny Abshire tells you how to perfect your technique to run for a lifetime. 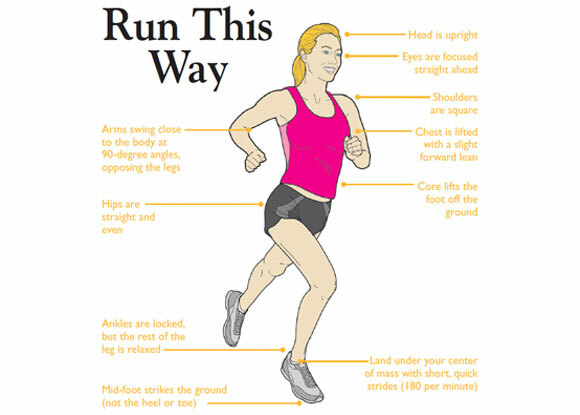 How would you describe proper running form? Danny Abshire: Proper running form means efficient running form. In order to run efficiently, you must minimize your impact with the ground, reduce your vertical motion and use your whole body—not just your legs. The movement should be athletic and fluid. To achieve this, you must perform short and quick strides. I recommend taking a minimum of 180 steps per minute. During each stride, you land parallel to the earth on your mid-foot or forefoot (not the heel or toe). Almost immediately after, your core lifts the leg off the ground. Your chest is upright, your body leans forward slightly and your arms swing in a relaxed motion to counterbalance the legs. What is the most common form mistake? DA: Over-striding with a slow cadence. If your foot pounds into the earth in front of your body, you incur an impact that’s three to five times that of your weight. This shocks your muscles and joints, putting you at risk for injury. Additionally, a stride that’s too long will throw your entire body out of whack. If you over-stride, you will almost land with a stiff, extended leg. Your body will be slung backward, your hips rotated and your shoulders twisted to compensate. As the heel strikes, it breaks your forward momentum. You then have to slap the ground with your foot and use a great amount of force to push off again to get yourself moving. This break/push action is both inefficient and potentially harmful. DA: The development of bulky, highly-cushioned running shoes has had a huge impact on our bodies. Running shoes with raised heels and lots of cushioning can alter your balance and interfere with your sense of where the ground is. If your running shoe has a high heel, it prevents you from landing parallel to the earth, throws off your natural balance and encourages you to land on your heel or toes rather than the mid-foot. Consider this analogy: If you run across a field barefoot, you’ll land on your mid-foot using quick, gentle steps. If you tape a large piece of foam to your heel, you’ll almost certainly land on your heel and take clumsier strides. What are the benefits of running with better form? DA: By improving your form, you will become a more balanced and coordinated runner. You will land on the ground with less impact and experience less torque in the upper body, back and hips. In my opinion, it is clear that this is a safer way to run. What are the first steps a runner can take to improve her form? DA: First, ask yourself if you have the time, patience and willingness to re-learn running movement. You have to be committed to slow down. Transitioning to a more natural running form takes time. I recommend allowing at least eight weeks for re-tooling. If you try to rush the process, you risk developing strains and experiencing discomfort. Second, perform some basic drills. Start by marching in place. Stand up straight, lifting your legs up from your core while swinging your arms in opposition. Then pick up the pace so you’re jogging in place, touching the ground at 180 steps per minute. (You can download a metronome app for your smartphone to ensure you’re meeting this mark). Now imagine a cable attached to your chest pulling you forward and upward. Begin running, maintaining a fast cadence and landing right underneath your body with the mid-foot. This is a lot to take in, so it’s helpful to hook up with a running coach or clinic to ensure you’re on the right track. Practice running with your new form, extending your distance and increasing your pace very gradually. You have to run a lot of quality, slow miles before you can run quickly. Don’t be in a hurry—enjoy the journey. Make the time investment now, and you’ll enjoy a lifetime of great running. Danny Abshire is a passionate lifelong runner and cofounder of Newton Running, where he has spent 10 years designing and refining Newton shoes. The author of Natural Running, Abshire has worked closely with thousands of athletes, from beginners to Olympians, to help them improve their running form.